Prosciutto Frittata, an easy, gourmet first course from Thyme for Cooking. 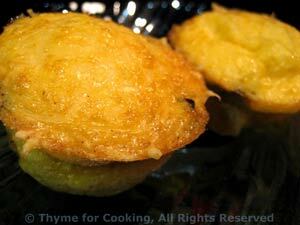 These Frittatas look like cupcakes but are actually fluffy eggs, mixed with small bits of anything savory. These have bits of Prosciutto and cheese. They can be served, hot, warm or cold and are great to do ahead for a party or, in summer, a picnic. Divide the cheese, Prosciutto and chives evenly between the cups.